Last year, GEICO took on the YouTube skip button with its “Unskippable” campaign. This year, they had a new pre-roll problem. An online media buy without any skip buttons. So how do you keep people from hating a pre-roll ad they’re forced to watch to the end? Simple. You fast-forward through it. 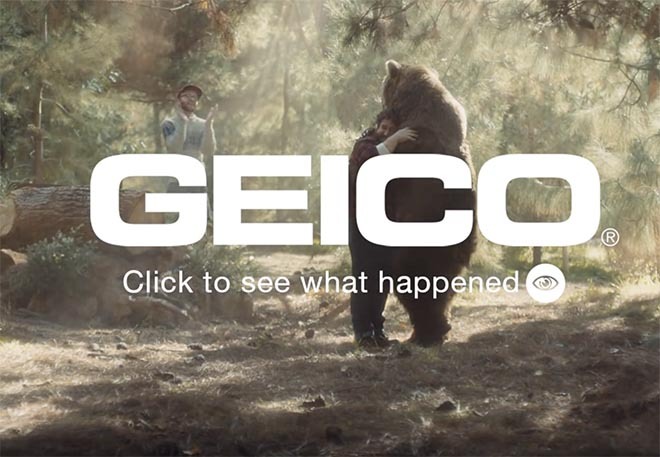 Geico Fast Forward introduces four 15 second pre-roll ads, Forest, Hike, Lake, Going Up, that do just that. Each ad begins in a mundane situation then fast-forwards ahead to something much more unexpected. At the end, you can click to watch the unabridged version of the ad and see what you missed. The goal is to take the most annoying 15 seconds in advertising and turn it into something so disruptive and entertaining, you’d actually choose to watch more. The Geico Fast Forward campaign was developed at The Martin Agency by chief creative officer Joe Alexander, group creative directors Steve Bassett and Wade Alger, creative director/copywriter Neel Williams, associate creative director/art director Mauricio Mazzariol, executive producer Brett Alexander, broadcast producer Liza Miller, junior broadcast producer Coleman Sweeney, group account director Brad Higdon, account executive Allison Hensley, account coordinator Allie Waller, business affairs supervisor Suzanne Wieringo, financial account supervisor Monica Cox, senior production business manager Amy Trenz, project manager Karen McEwen, working with Geico VP marketing Ted Ward, senior marketing director Amy Furman, marketing media advertising director Bill Brower, senior manager broadcast outdoor print and sports marketing Melissa Halicy, marketing supervisor Mike Grant, marketing buyers Tom Perlozzo and Brighid Griffin, and marketing coordinator Julia Nass. Filming was shot by director Nick Ball via Furlined with producer Jason Gilbert, senior executive producer David Thorne, executive producer David Richards and president Diane McArter. Editor was Frank Effron at Cut + Run with executive producer Carr Schilling, producer Annabelle Dunbar-Whittaker and assistant editor Brian Meagher. Post production was done at MPC by executive producer Lexi Stern, senior producer Juliet Tierney, production coordinator Valentina Cokonis, line producer Deepanjali Singh, VFX supervisor Gizmo Rivera, VFX supervisor/Nuke lead Jim Spratling, compositor/Prep lead Avinash Bhandary, Roto lead Sivakumar R, and colourist Ricky Gausis. Music was produced at Black Iris by composer Justin Bailey with executive producer Jon Spencer, senior producer Amanda Patterson, executive creative director Justin Bailey, creative director Rich Stine, composer Justin Bailey. Audio post production was done at Rainmaker Studios by engineers/mixers Jeff McManus and Mike O’Connor.